At this point the wife is in tears. Among other things, she doesn’t like the “Almond Glaze” color. It has been a long day for her (and myself) and the yellow color was just too much. It’s a little greener than I’d though it would be, but the more I see it, the more I like it. 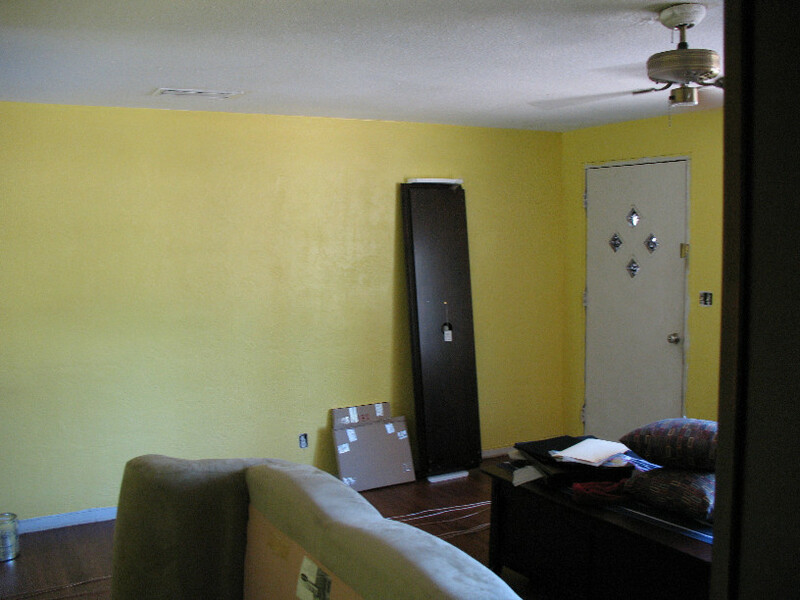 Not wanting to repaint the room again has nothing to do with my preference. Really. Not the Sistene Chapel, but hey, you ain't the Pope either. Note that the entertainment center arrived early in the morning and is included in the pictures. Also in the delivery was the slightly large coffee table I purchased. The kind folks at American Signature Furniture call it a Trunk, Pop-Up. The wife adores it (“I love it!”). Pretty neat little deal, 5 casters so it moves around well, gobs of storage (enough for an entire Rock Band), and about 2/3 of the surface raises up and forward about eight inches. Making a very comfortable table for two.